Maynards Bassetts, the brand behind the UK’s bestselling candy bag, is bringing more fun to joyful candy with the launch of a new soft jelly product to help drive young adults ‘wild’. 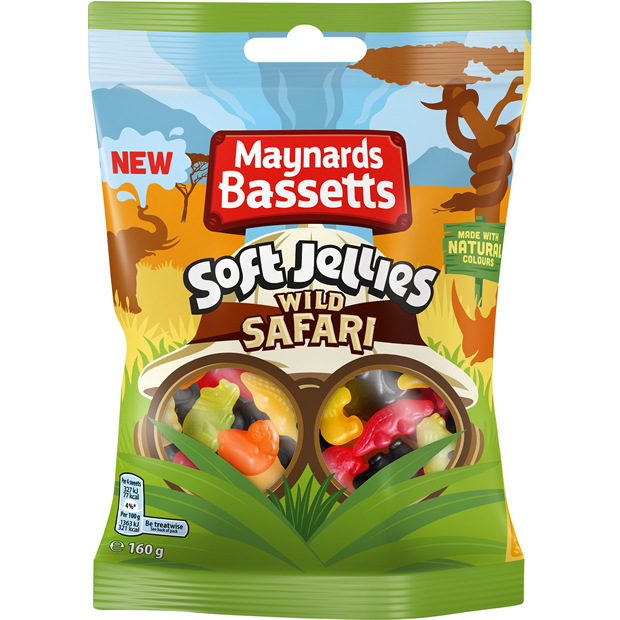 Launching in August, Maynards Bassetts Soft Jellies Wild Safari is a new 160g bag of soft jellies bursting with flavours of lemon, raspberry, orange, blackcurrant and lime in a variety of safari animal shapes. The new jellies are proudly made with natural colours and is also the first medium Maynards Bassetts bag featuring a fun window design. Jellies is the number one candy technology and is driving the growth of the total joyful candy market1. While the format is well established amongst a younger shopper profile, as well as large households with children, Maynards Bassetts has identified a white space opportunity to recruit adults without children into the segment. Marta Sanso, senior brand manager for Joyful Candy at Mondelēz International, says: “As one of the UKs best loved candy brands, we look to continuously innovate to bring new fun tastes and textures to the market. Over the last 12 months, we’ve brought gummies and jellies into small bags, and brought a host of new flavours with Wine Gums Mocktails, Jelly Babies Tropical, and Wine Gums Tangy which have been highly incremental to the category – Wine Gums Tangy alone brought in £1.6m incremental RSV in its first year! Mondelēz International, Inc. (NASDAQ: MDLZ) is building the best snacking company in the world, with 2017 net revenues of approximately $26 billion. Creating more moments of joy in approximately 160 countries, Mondelēz International is a world leader in biscuits, chocolate, gum, candy and powdered beverages, featuring global Power Brands such as Oreo and belVita biscuits; Cadbury Dairy Milk and Milka chocolate; and Trident gum. Mondelēz International is a proud member of the Standard and Poor’s 500, Nasdaq 100 and Dow Jones Sustainability Index. Visit www.mondelezinternational.com or follow the company on Twitter at www.twitter.com/MDLZ.